Have you heard about water ionizers that you can install in your homes? Water ionizers are machines that can turn tap water into alkaline water, which many can attest, offer a lot of great health benefits. The water ionizer does this by using electrolysis and charging the water to positive and negative, which is then separated as acidic and alkaline. The alkaline water produced by the water ionizers are the ones that are use for drinking and balances the PH levels, thus producing a healthy body. These water ionizers can be bought online from stores like Alkaline Water Plus where consumers can choose from different brands of water ionizer depending on the price, the style, the design, the component and many more. 1. Price. The price is always the number one deciding factor when shopping around for water ionizers. Some ionizers can cost around $1000 or more as it is made from high quality materials that can last for years. Some brands can be more affordable as it uses imitations for some of its component, thereby reducing the life of the machine and the quality of the alkaline water that it can produce. 2. Warranty. When choosing the right brand of water ionizer that will give you value for your money, it is important to take into consideration the warranty that the manufacturer is offering. Some manufacturer like Enagic Kangen only offers 5-year warranty while some like, Tyent, have lifetime warranty on parts and labor. Consumers must also check the details of the warranty as some manufacturer will only offer warranty on the ionizer plate and will charge on replacement of other parts and labor. 3. Materials use for the Ionizer Plates. A good quality ionizer plate should be made from titanium that is strongly coated with platinum. Ionizer plates made from these materials will last long, even up to 15 years and more, as the platinum prevents the contact of the plate with water prolonging its life. Since the ionizer plate is the one in charge of ionizing the water, it is important that it is made from materials that will not leave metal residues to the drinking water that can cause health complications. 4. Dimension of the Ionizer Plate. Ionizer plates with bigger dimensions can charge the water more consistently, thus purifying more volumes of water. 5. Volume of Water that it can handle. 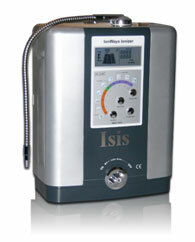 Do you want to have instant alkaline water as soon as you turn on the ionizer? Do you need large volumes of water or just enough for the number of family members? These are the things that you need to ask so you can choose the right water ionizer that can produce the volume of drinking water that you require. Having easy access to alkaline water everyday can have a good effect on ones health that is why everyone should consider getting one for their home. And the pointers mentioned above will be a big help when deciding for the best water ionizer for you. Aggie Aviso is a freelance consumer and business writer, writing comprehensive reviews, articles and how-to’s. This entry was posted in Uncategorized and tagged alkaline water, best brand ionizer, health benefits ionizer, ionizers, water ionizer on February 3, 2012 by Yami.